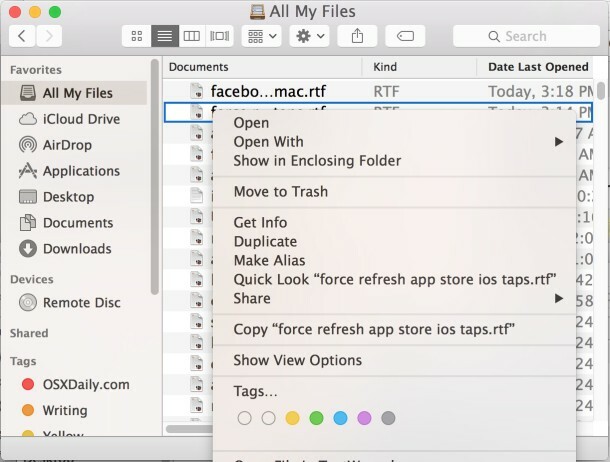 All My Files is one of those features of Mac OS X that was somewhat controversial at first, but once you start using it often, you can stop sorting files yourself in the Finder and just let All My Files, search, and Spotlight manage documents instead. You’ll be immediately transported to the folder containing the file you selected, with the originally selected document highlighted. It doesn’t matter how the item is named in the menu option, the function is the same, it will open the selected item in it’s original location on the file system of OS X, where ever that may be. This is not to be confused with the separate keyboard shortcut to jump to the parent directory of the current file or folder, which is also labeled as “Enclosing Folder”. That shortcut is dependent on the current directory, not the currently selected file. I’m running ML on an early 2008 MBP and do not have this feature at all. You have to be in All My Files or another Smart Folder, it’s not going to be anywhere else. Sorry to pick you up on this, but could you *please* learn to use the apostrophe possessive form (e.g. file’s)? I’m afraid “a Files” or similar is very distracting and just looks uneducated and detracts from your advice. It’s labeled “ALL MY FILES” not “ALL MY FILE’S” why don’t you open your Finder and find out yourself. Anne at 1:36 pm is referring to the third word in the article title, and she is correct. Highlighting the file and pressing Command + R is the equivalent. Good tip… and seriously who cares about the lack of an apostrophe? Get a life people, this is a site about Apple not the online syllabus for English 621. LOL.